Nelle Langhe, sulle colline tra Cherasco e La Morra si trova una cascina settecentesca abbandonata da circa 30 anni e ora in comodato d'uso all'associazione LaCasaRotta. Recuperiamo una cascina abbandonata per farne un centro di incontro e aggregazione, un laboratorio attivo di cultura, un crocevia di scambi tra saperi diversi e prove pratiche di sostenibilità ambientale. 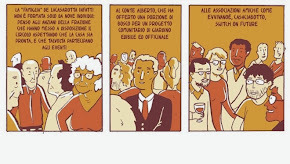 Un luogo dove le persone possono incontrarsi, dialogare ma anche imparare, progettare, sognare, esprimersi, bere, mangiare, suonare, fare arte, rilassarsi, ballare, coltivare, giocare. Un luogo per trovare nuove "rotte". La Casa è un luogo, fisico, bello, accogliente. Ed è rotta perchè è la rottura degli schemi e delle forme che ci interessa: trovare nuove "rotte" ovvero nuovi orizzonti, direzioni e paradigmi più umani e sostenibili. Un viaggio nomade-stanziale per raccontare che, con costanza e ostinazione, si possono tracciare nuove rotte. Oggi a LaCasaRotta puoi trovare: un forno comunitario, uno spazio per ospitalità temporanea, laboratori, incontri, esposizioni e concerti, un gruppo di acquisto solidale. Dopo il restauro, LaCasaRotta diventerà un ecovillaggio, cioè un progetto di cohousing, per condividere spazi e tempi tra persone diverse, sarà inoltre un circolo-bistrot-culturale e un progetto agricolo sostenibile. LaCasaRotta is an association founded by a group of young people to restore an abandoned farmhouse and turn it into a centre for meeting and gathering; an active laboratory for culture; a crossroads of exchange between different types of knowledge; a space for experimenting with environmentally sustainable practices. It is a place where people of different ages and backgrounds can meet and talk, but also learn, plan, dream, express themselves. LaCasaRotta wants to move in new directions as well as retracing those forgotten; create new meeting places; a real exchange between generations and cultures; opportunities for solidarity to combat exclusion and return to simply being together: the community. After the restoration, the farmhouse will also become a co-housing project for sharing space and time with different people, as well as a bistro and cultural circle. LaCasaRotta organises small laboratories open to people of all ages and backgrounds to spread the knowledge of local traditions and other cultures, marked by high quality produce from small local producers at zero-food-miles or, if not available in the local area, fair trade produce. These events have been opportunities to exchange knowledge and best practices; moments to learn once again how to live together, sharing things that are as simple and, at the same time, as important as food and the traditional practices of food processing. In 2012, we organised various workshops: "Jam Day" in January to learn how to make jam from winter watermelons (an old watermelon variety that has mostly been forgotten), "Tajarin Night" in February, "Agnolotti Day ... Plin!" in May and "Make the Bread, Make the Oven" in July, where we learned how to make sourdough bread and built a small earthen oven for family use. To end the year, we organised "What Gnocchi ", an event to learn how to make potato gnocchi. We also organise educational workshops for children to teach them about nature, respect for the environment and manual skills ("Lab-Garden", "Knead the Dough" and "Recycled Trees and Christmas Cookies"). LaCasaRotta is a sustainable agricultural project: we have begun to grow on small plots of land belonging to our parents (we use sustainable methods, which are inspired by biodynamic and homeopathic techniques) while we're gaining the knowledge necessary to start an agricultural activity that can truly support this project. For this reason, we are now looking for land to start this activity.